I tested positive at 22 years old. I was shocked. I spiraled inward. Imagined rooms full of judging eyes on me. I felt shame. I thought, How will I survive this? I am a 25-year-old white man living in New York City. I was raised by neoliberal journalists, under whose health insurance I am covered until November. I am undetectable and healthy, taking just two pills a day to keep my viral level suppressed. I have a gym membership and enjoy a freelance life in the arts. I’ve got it pretty good. And yet, this new diagnosis has been something of a trial by fire. But why the woe? After all, HIV—for those who have access to meds—is a manageable condition today. The answer is stigma. We live in the aftershock of an age of major trauma around the virus. Because of where I’ve come from, I have the luxury—the privilege—to be public about my status without fear of my safety net snapping back. 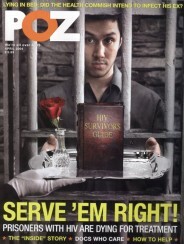 This also includes the privilege of sharing my story candidly and publicly. When I tested positive, I reached out to friends and family. One dear friend, Victor Jeffries, told me: “I love you.… Document everything.” The next few months, I chronicled my experience with a DVCAM, filming anything and everything around me on the grainy low-fi camera. I filmed myself alone, musing to the camera. I taped myself masturbating. I documented personal moments between my partner and me. I recorded picking up my meds and footing the 2,000 euro bill, taking my meds for the first time, going on vacation to Greece where my boyfriend and I eventually broke up. The camera became something of a moving-image diary for dumping my most personal (and embarrassing) truths and expose my shame to light. NSFW Positive (trailer) from Linus Ignatius on Vimeo. This was a major move toward healing and recovery for me. As I got public and aired out some of my shameful feelings around the matter, I noticed some profound changes in my life. After crying on the phone with my parents at the doctor’s office while my blood was drawn for the first time, I settled into an ungodly sort of calm in the weeks that followed. An exterior that belied major fear and anxiety underneath the surface. 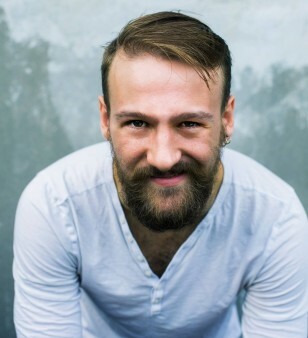 I was out clubbing, taking whatever drugs I could get my hands on, sleeping very little and losing myself in a relationship with someone I had no deep connection with. One memory stands out in particular: I had been out all night partying, and it was time to take my morning pills. As I popped open my pill case, they fell across the dirty floor of the club. I spent 20 minutes on my hands and knees, coming up on ecstasy, searching the dance floor for the blue and yellow of my antiretroviral capsules. Time was a blur, and I was so cocksure in the midst of it, insisting that my life was peachy and riding an ego high. But underneath my manic exterior, things were shifting seismically within. Over the months, I started educating myself. I disclosed my status to all those who were close to me, and I learned about the reality of managing HIV today. I took steps toward recovery. I moved back to New York City, found sobriety and regained my passion for acting. I began to weave activism into my mission as a creator. I found ways to sit with my feelings, instead of picking up drugs or turning to other addictive behaviors. It’s been an ongoing process that continues for me today—a process of finding meaning in life—and I am thankful that my seroconversion, with its reminder of mortality, left me with this newfound direction. I am also grateful to say that after working on my film for over a year, I finally premiered Positive, with the help of the producers at RYOT Films, at the 30 Under 30 Festival in late 2016, in partnership with the United Nations. Not everybody has it so easy. I’ve had the chance to tell my story, but I know of countless individuals who feel they could never disclose their status to their parents. Now, I am reaching out to unsung survivors (read: thrivers) living with the virus. As I build my next narrative film project, I am conducting an interview series with HIV-positive individuals in and around New York City. I am investigating HIV as it relates to race, insurance and loving relationships to lay down a mosaic of diverse perspectives around the virus. Through collaborative interviews and workshop sessions, we will generate material for a narrative project shooting this summer, based on true stories. Art will never exist in a vacuum, and this is true today more than ever. For one thing, the future of affordable care remains uncertain. In the interviews I’ve conducted so far, I’ve found that even those who have coverage struggle to meet their copays, which can reach upward of $900 a month. Because of latent stigma, many of us believe we are doomed to be alone, that nobody could love us with our untouchable disease. Immigration policies seem unstable at best. There is a fundamental social component to creating work around topics that audiences are still kind of squeamish about, to breaking the silence. 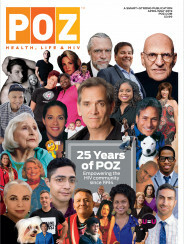 I am grateful for POZ magazine as a platform to reach more people and to expand beyond my comfortable, familiar circle, to approach the artistic process as an inclusive, community-building opportunity. And I hope by making this film, I have a platform to offer to others who are dying to tell their stories. If you are interested in participating in this interview project, please contact me at linusignatius@gmail.com. Anonymity, if requested, will always be preserved. Below is the poster for Positive (if you’re curious, you can view the explicit version here). For more about me, visit my website at LinusIgnatius.com.